분청사기 인화점문 장군은 둥근 원통형의 몸통을 옆으로 누인 형태로서, 부분적으로 두들겨 모가 난 가장자리를 둥글게 다듬은 후 윗면 중심에 병의 구연부를 만들어 붙였다. 표면에는 크기가 작은 몇 개의 원이 새겨져 연주문(連珠文) 형태를 나타내는 도장을 이용하여 전면에 걸쳐 빈 곳 없이 빽빽하게 수많은 점을 찍듯 인화상감을 하였다. 유약은 엷은 청록색을 띠는 투명유로 전면에 얇게 씌웠다. 기형은 마치 메주를 두들겨 만든 것 같은 느낌을 주어 질박하고 당당하며, 전면에 인화문을 장식하여 매우 특색이 있다. 양식적으로 세련되었으면서도 동시에 투박한 멋을 겸비한 매우 독특한 인화분청으로 15세기의 절정기 작품이다. 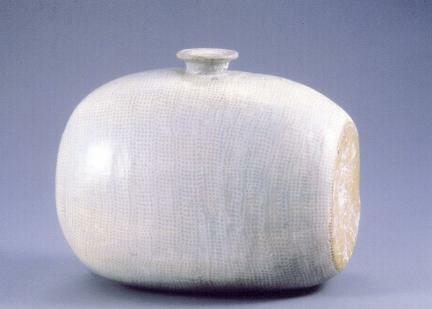 This vessel is shaped like a side-lying cylinder. Both ends of the cylinder were paddled into a convex shape, and a mouth rim was added around the opening in the middle, on the top side. The surface is densely filled with small stamped and inlaid bead motifs and is covered with a thin coat of a clear light greenish blue glaze. The bottle vase, rough and unpolished, as though kneaded and beaten to shape, has at the same time a majestic allure. The stamped dots completely covering the surface are highly original as well. 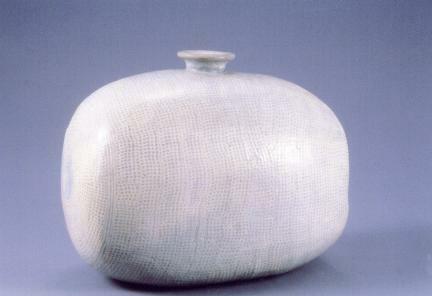 While sophisticated in the overall style, this one-of-a kind vessel radiates an untamed sort of beauty and appears to have been made during the 15th century, the high point of buncheong ware making.